Zap-Map was invited along to the UK launch of the Nissan Leaf 30kWh at Silverstone yesterday (Tuesday 26th January), giving us another chance at an early test for the new longer-range model. With around 12,000 UK sales, the current Leaf is the best selling electric vehicle (EV) on the market and has played an important part in increasing the growth of plug-in vehicles in the country. Since its UK launch in 2011, the Leaf has been been joined by the likes of the Renault Zoe, BMW i3, and VW’s e-Golf and e-up! in terms of pure-electric models, and a number of plug-in hybrid vehicles also to increase ultra-low emission vehicle (ULEV) sales dramatically in the last five years. As a market leader then, Nissan is keen to maintain its position as a familiar EV manufacturer to the general public, and this new version of the Leaf shows its commitment to improving the offering available to consumers. The previous generation of Leaf – the 24kWh battery model – had a quoted range of 124 miles, and a real world ability to cover around 99 miles on a single charge. The 30kWh model extends that official range to 155 miles which, although it is highly unlikely that drivers will ever achieve this figure, the real world range only drops to 124 miles – or the official range of the previous model. When we attended the European launch towards the end of last year, we had an extended and challenging test route set up which took us up into the Alpes Maritime, with some long climbing making the range plummet before a downward section that saw us recuperate a large amount of energy. This tested the Leaf’s range to extremes and it coped very well, averaging some impressive figures. However, it was worth seeing how well the new Leaf would do on a cold and wet January morning in Britain, with muddy surfaces, pot-holes and a wide range of different roads available to deal with. 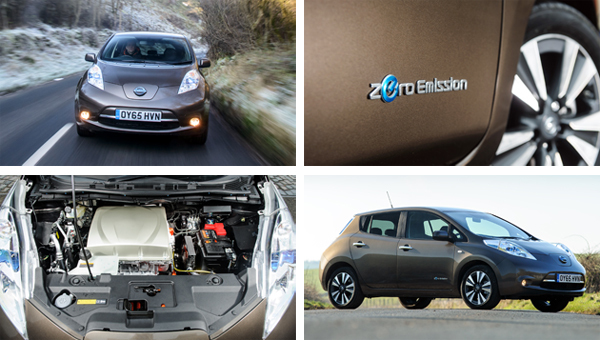 In terms of testing the biggest change to the Leaf – the increased range – the Nissan again performed well. The route was less obviously demanding, there are no mountains to climb in Northamptonshire after all, but conditions and roads represented a far more typical journey. The car we were allocated came with a full charge and an indicated 99 miles worth of range. This low figure was explained by both a cold night and, of greater impact, the fact that the car had been used for press images the previous day, with the Leaf having weighted its indicated range to some spirited driving. Deciding to treat the Leaf without any deference normally due to an EV, we set off on the route and drove exactly as if we were in a petrol or diesel model. The only difference was the use of the Leaf’s Eco button once acceleration was completed and we were largely up to speed. This meant sitting at around 70 mph on dual carriageways and motorways for about a third of the 55 mile route. Off the motorway, we were directed along typical A-roads travelling at a consistent 50-60mph, depending on traffic. By the time we got back to base after also driving through villages and along B-roads and back roads, the result was that the Leaf was showing around 60 miles used. On the face of it, this might sound like a poor return but the Leaf 30kWh was never used in a large town or city – its most natural habitat – and there was no tailoring of driving style to make the most of an EV’s strengths, putting the electric Nissan to a stern test. I’m confident that had I driven in typical EV style – careful acceleration, more considered use of the battery regeneration mode, and lower top speeds – the course would have been completed with at least 50 miles still showing, and probably 60 miles, with more time needed to recalibrate it’s range calculations. This would certainly tally with my previous drive of the Leaf 30kWh where a more frugal driving style was used. Why didn’t I drive like this and see what the best possible range was from the Leaf 30kWh? Well there are a few reasons. Firstly, sharing the Leaf 30kWh with another driver meant that half the route was out of my control and I knew there would be no EV quarter given by my co-driver. Secondly, if the Leaf 30kWh performs admirably at speeds and driving styles that are not tailored to EV driving, it is a safe statement to say that the Leaf will manage this sort of range performance at the very minimum. We’ve proved that, even though weather, roads, and driving styles didn’t suit EV driving at all, the Leaf 30kWh will comfortably cover 100 miles with absolutely no effort. That’s more than can be said for its rivals and is a useful piece of information for those considering buying a Leaf. As for the rest of the car, little has changed in a big way but lots of areas have been tweaked. 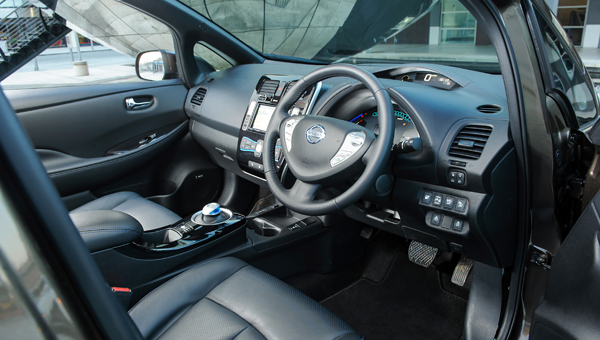 The previous and often derided CarWings system has been replaced with a new NissanConnect navigation and infotainment system. This allows you to pre-condition the car, send routes found on your desktop to the car’s navigation system, and offers a good level of entertainment connectivity with USB, aux and Bluetooth systems to connect your mobile or MP3 player. The system is clear and well laid out, with the navigation screens easy to use and fast to calculate routes. Charging points in the area can be found quickly, and the whole system seems to have been streamlined to improve functionality and make it more intuitive. It will be interesting to find out what it’s like to live with but early impressions are good. The rest of the car remains largely the same as before. The cabin is a decent place in which to sit, there is a lot of equipment available and the Leaf 30kWh’s battery takes up the exact same space as the 24kWh version, so interior space remains the same. The increased range is all down to a battery with greater energy density thanks to new materials used in construction. The overwhelming impression given by the Leaf 30kWh is how easy, comfortable and stress free it is to drive. There was an impressive lack of wind, tyre or motor noise – even at motorway speeds and in poor weather – while the simple-to-use single-gear gearbox offers just four settings; park (P), reverse (R), drive (D) and drive with increased braking energy regeneration (B). Hop in, get comfortable and away you go. That impression remains during the drive with the suspension set up for comfort, and pot-holes brushed away easily. The Leaf is never going to match up to hot-hatch levels of handling, but then it’s not supposed to and, with suspension set-up to conquer the obstacles found during town driving, the Leaf will prove relaxing anywhere. Thanks to consistent development, the Leaf is now a good all-round car. The dashboard could be made from nicer plastics, some would prefer a stiffer ride, and you have to work up to overtaking moves at higher speeds, rather than rely on the instant torque that will let you nip into spaces around town at lower speeds. There are always compromises though and the Leaf is a refined vehicle in the small family hatch class, even when compared to its conventionally powered rivals. Crucially, the new longer range is likely to tempt more drivers into buying a Leaf. The range will be more than enough for most, charging times remain the same as the 24kWh version – which remains on sale by the way for a cheaper entry point into EV motoring – and the Leaf is a reliable and proven machine. Prices for the Leaf start at £20,790 for the 24kWh Visia entry level model. Move up to the new 30kWh version with 25 per cent more range and prices begin at £24,490 in Acenta trim, with top of the range Tekna including 6kW charger and solar cell topping out the price list at £27,940. 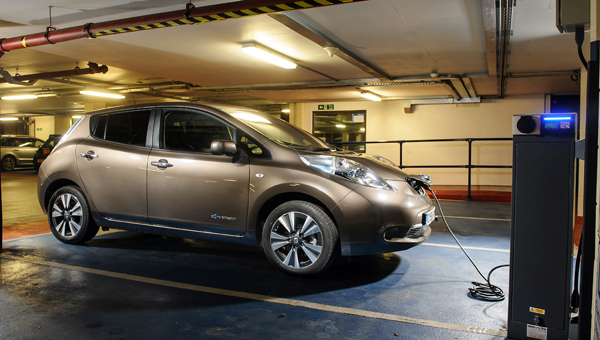 The 30kWh Leaf represents a £1,600 increase over the 24kWh model when comparing like-for-like specifications. These prices are with the £5,000 UK Government’s Plug-in Car Grant (PiCG) included and it is worth noting that the Nissan Leaf, as a pure-EV, will still be eligible for the maximum level of funding even when the PiCG regulations change. The longer range doesn’t make the Leaf a brand new car, nor is it a huge jump in performance, but with Nissan committed to the sector and constantly working on improving its EV offerings, the Leaf is now better than ever – and good enough to persuade more buyers into owning an EV.